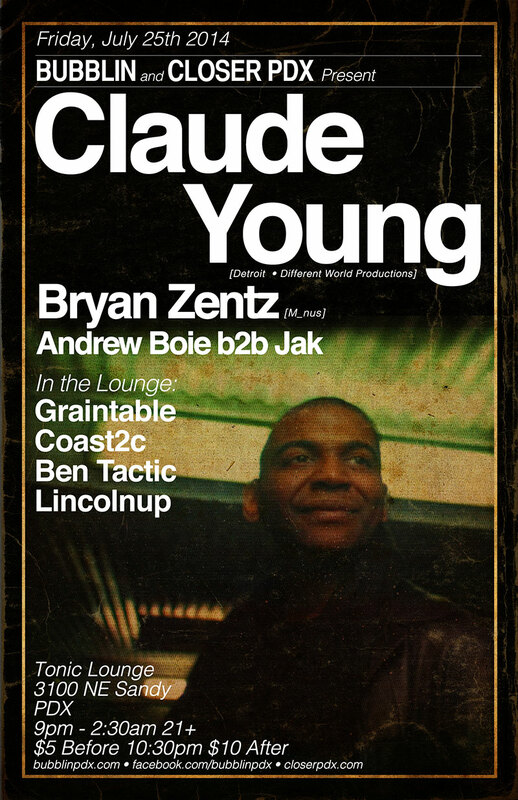 Claude Young Jr. is acknowledged globally as one of the most respected producer / DJs to come from the legendary home of Techno, Detroit, Michigan (USA). Magazines, newspapers & websites frequently credit him as one of the most exciting and innovative DJs of the last two decades. Currently Young is producing his new solo album “Celestial Bodies” for Japan based label Fountain Records. He is one half of the group Different World along side long time friend and production partner Takasi Nakajima. After their highly praised first release “Rapture” for UK artist Kirk Degiorgio’s ART label, a Remix for Phil Agosta’s single “Carousel for KMS Records”, and Octave One’s last single “New Life” for 430 West Records, Different World have now been signed to Kevin Saunderson’s legendary KMS Record Label. DW also performed their first live show as the headlining / closing act on the Detroit Stage of the 2007 edition of the Detroit Electronic Music Festival “Movement”. Young returned to his home town in 2011 to perform the closing set on the Made in Detroit Stage at “Movement 2011” and his set was praised by many as the hi-light of the festival weekend. Following his various solo club and festival performances Young and Nakajima finished 2011 with an extremely impressive tour of the USA as Different World, performing an 8 Hour (all night) set at the legendary “BUNKER” club in New York City, then moving on to play Washington DC & Pittsburgh all in a matter of a few days. DW frequently tour Europe on a regular basis frequenting Tresor Club (Berlin), Berghain (Young was invited to play their 6th Anniversary Event and was a frequent guest at their original club Ostgut), and many clubs in Spain, Norway, the UK, France & Belgium just to name a few. His solo production, official DJ mixes and Remix credits include: Mixed the only official DJ Mix Compilation for Jeff MIlls Axis Records (AX-033 Claude Young – Thoughts Of Phutura), His own Claude Young DJF-1100 Mix for Sony Music Entertainment Japan, his legendary Claude Young DJ-Kicks Mix for K7! (K7045cd), Three Berlin based mix CDs, DJ Rok / Claude Young – Essential Underground Vol. 03: Berlin / Detroit, Raveline Presents: Paradise Mixed by Claude Young & a mix for long time Austrian Born Berlin Based friends Memory Foundation / Ratio – Welcome To Central (mixed by Claude Young). He has remixed & produced records for some of the most respected names in the business across all musical genres including Octave One, Inner City , Carl Craig, Jay Denham, Sven Vath, 4Hero, Slam, Joey Beltram, Gary Numan, Mijk Van Dijk, Technasia, Andrew Duke, Beroshima, The Reese Project, Musto & Bones and many more. This entry was posted on August 25, 2014 at 4:16 pm and is filed under Uncategorized. You can follow any responses to this entry through the RSS 2.0 feed. You can leave a response, or trackback from your own site.